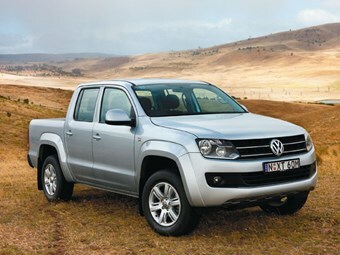 Volkswagen has captured just the right mix of masculine dimensions (the Amarok is longer, higher and significantly wider than a Navara ST-X) but has cleverly engineered in the road manners of a European car. 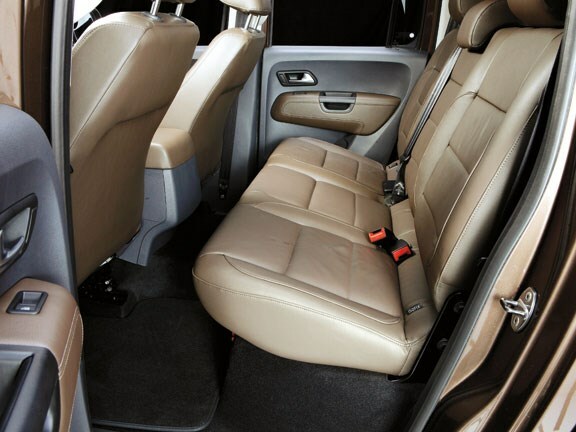 I used the Amarok to make several Auckland-Hamilton treks for the recent Camper Care NZ Motorhome and Caravan Show and couldn’t fault the cosseting seats or interior design. For those familiar with the likes of Volkswagen’s passenger vehicle line-up, this is all fairly familiar stuff, with some obvious parts bin raiding from the popular Golf or Passat models. Not a problem, especially when you already have a reputation for producing among the best interiors available. 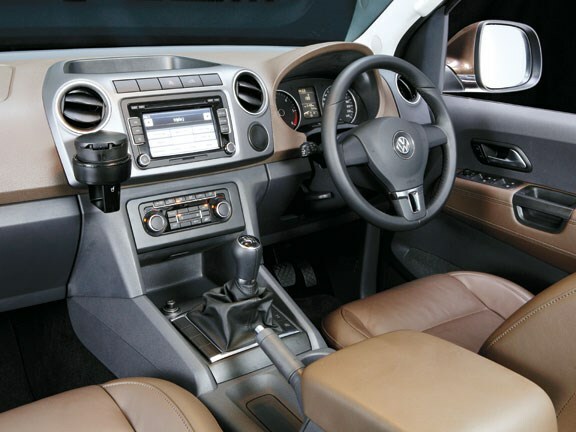 You have to tick a few option boxes to get the vehicle up to comparable specification with other ute models: cruise control, for instance, is standard across the board on a Navara, but the convenience (with an extra multi-info display) adds $500 to all but the highest grade Amarok. A mechanical diff lock is available on some Colorado and Triton models as standard, but will set you back $1250 here. From there, you really can go crazy, rear parking sensors: $550, heated seats: $750, a voice-controlled 6.5-inch colour display audio system with six-disc CD changer: $900, and leather upholstery is $3000. All great stuff, if you’ve got deep pockets. It is as safe as any passenger car though, and the Amarok (Highline specification) is the first commercial ute to be awarded five-star crash safety rating NCAP. For those who think size and safety go hand in hand this might be a surprise, but despite being built for rugged conditions ute occupants don’t always fare well in accidents. Stick with the higher-equipped "Highline" model and you can rest assured in this safety of you and the family, it comes standard with stability control, front and side airbags and a diagonal centre rear seatbelt. The base model misses out on the diagonal belt and side airbags; these can be included for a reasonable $650 but leave this model for farmers, this will be clearer later. It feels anything but agricultural and the ride is uncharacteristically compliant for a ute, though, admittedly, I wasn’t able to load this vehicle up with a caravan to fully test the leaf-sprung rear end. 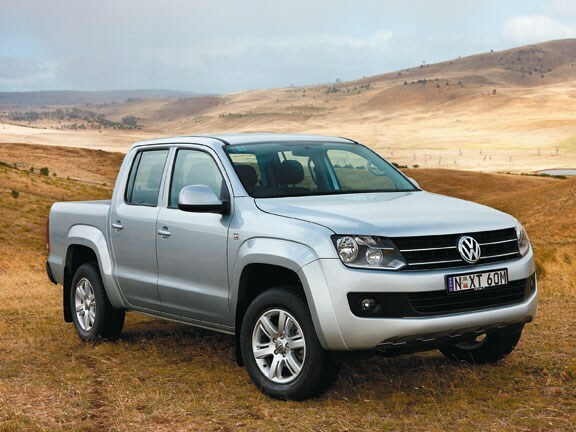 Typically ute suspension by design is best loaded up and its suppleness suggests the Amarok isn’t as rigid as the like of the Hilux or Navara. This makes it – convincingly – the best driving/handling 4x4 ute on the market today, but it may also work against it when carrying weightier payloads. 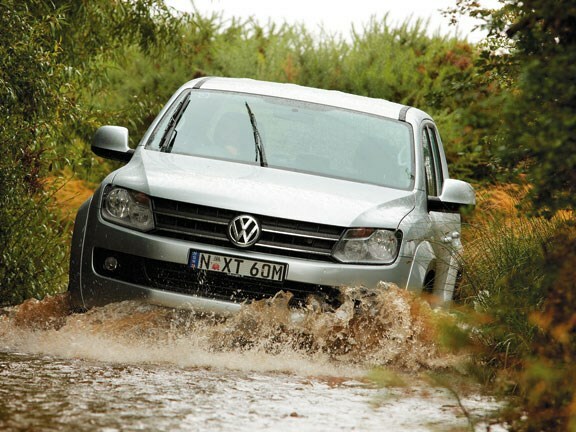 Volkswagen’s claimed tow rating is a maximum 2800kg braked on any model in the range. I’m confident the well planted nature and generous footprint of the Amarok will cope with most towing tasks, but where possible those with really hefty caravans might be wise asking for a brief tow trial before signing on the dotted line. You’ll also want to stick with the Highline for several reasons actually. For a start it offers much of the creature comforts regular open road use requires, including dual zone climate air conditioning, cruise control, upmarket trimming, carpet floor covering (instead of farm-grade rubber mats) quality audio and the fancier exterior options like colour-coded front bumper, door handles and mirrors, a chrome rear bumper with step and privacy glass to keep prying eyes off valuables left inside. But more importantly, the Highline’s engine specification boasts more grunt. The little two-litre develops just 90kW of power and 340Nm of torque in base 2WD spec, but in 4WD or Highline models the engine receives an additional turbo to boost outputs to a remarkable 120kW/400Nm. Definitely on par with the more potent utes on offer.